Every time a toilet is flushed now in Byron Bay, the processing of its contents is ecologically sound. This positive result is the outcome of a collaboration between ecoteam ecotechnologist Dr Keith Bolton, NSW DPI Agriculture, Environment Australia, Southern Cross University and Byron Shire Council. Dr Bolton was the Scientific Coordinator and Project Manager of the 24 ha Byron Bay Effluent Reuse Wetland project, in which 750,000 paperbark trees were hand-planted to reuse and ‘polish’ Byron Bay’s sewage effluent through its final or ‘secondary treatment’ stage. 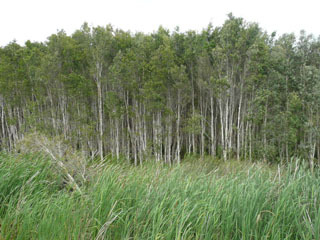 As the effluent passes through the wetland, the trees pump water into the atmosphere, reducing the hydraulic load on Byron’s formerly pristine and now heavily-stressed waterways. Effluent that does make its way into the surrounding area is polished and primed, making it much safer for environmental discharge. Dr Bolton and his colleagues also demonstrated that effluent can be used to manage acid sulfate soil and to regenerate a degraded wetland. The Byron Effluent Reuse Wetland has become an important habitat for a diverse range of local wildlife, and is rapidly becoming a major tourist attraction.